This device is called Symbio and it was designed by Elium Studio for Thomson. 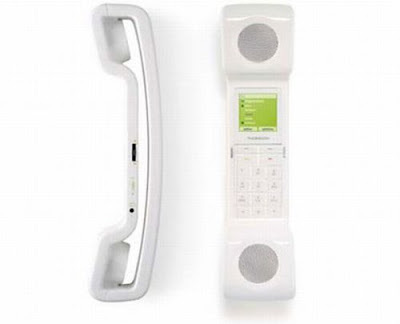 The gadget represents a cordless phone which, when connected via VoIP telephony, turns into an Internet radio, allowing you to surf through the regional, national and international radio stations. The Symbio boasts HiFi ring-tones, HD sound, stereo speakers and color screen. In addition it allows you to send SMS text messages. You are free to select from a wide range of Internet radio stations. Besides, you can manage and update RSS feeds by making use of a special option called MyInfoKiosk.